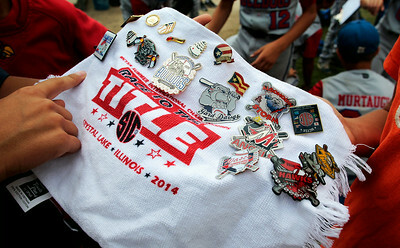 Kyle Grillot- kgrillot@shawmedia.com Crystal Lake Bulldogs players look over pins from various teams after beating the Lake in the Hills Thunder, 11-3 during the McHenry County Youth Sports Association 11-U division baseball tournament game at Lippold Park Monday in Crystal Lake. 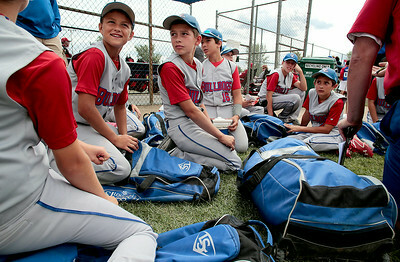 Kyle Grillot- kgrillot@shawmedia.com The Crystal Lake Bulldogs listen to head coach Bob Coakley after beating the Lake in the Hills Thunder, 11-3 during the McHenry County Youth Sports Association 11-U division baseball tournament game at Lippold Park Monday in Crystal Lake. Kyle Grillot- kgrillot@shawmedia.com Spectators and players exit Lippold Park during the McHenry County Youth Sports Association baseball tournament game Monday in Crystal Lake. 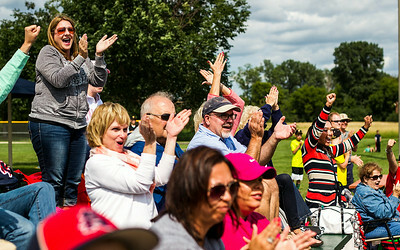 Kyle Grillot- kgrillot@shawmedia.com Team PowerPipe fans celebrate a scored run of their first inning against Wisconsin Team Delmarini during the McHenry County Youth Sports Association 11-U division baseball tournament game at Lippold Park Monday in Crystal Lake. Kyle Grillot- kgrillot@shawmedia.com Crystal Lake Bulldogs' Ethan Stewart slides safely to second base as Lake in the Hills Thunder's Jake Lyon attempts to tag him out during the fifth inning of the McHenry County Youth Sports Association 11-U division baseball tournament game at Lippold Park Monday in Crystal Lake. Kyle Grillot- kgrillot@shawmedia.com Waukesha PoundTown Spiders' Christopher Zak pitches against Japan during the fifth inning of the McHenry County Youth Sports Association 15-U division baseball tournament semifinal at Lippold Park Sunday in Crystal Lake. 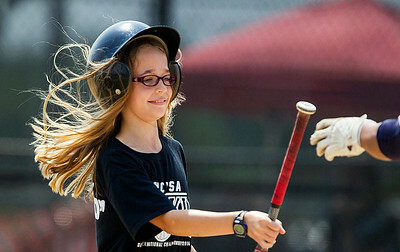 Kyle Grillot- kgrillot@shawmedia.com Ciara Weber, 11, of Crystal Lake hands a bat off to Japan's Kotaro Suno during the the McHenry County Youth Sports Association 15-U division baseball tournament final at Lippold Park Sunday in Crystal Lake. 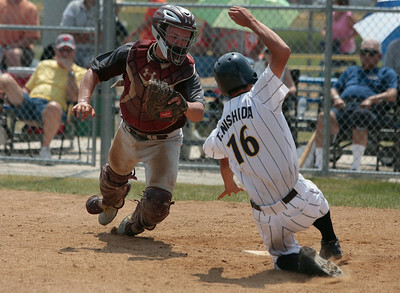 Kyle Grillot- kgrillot@shawmedia.com Waukesha PoundTown Spiders' MJ Houdek goes to tag Japan's Tasuku Nishida out at home plate during the fifth inning of the McHenry County Youth Sports Association 15-U division baseball tournament semifinal at Lippold Park Sunday in Crystal Lake. 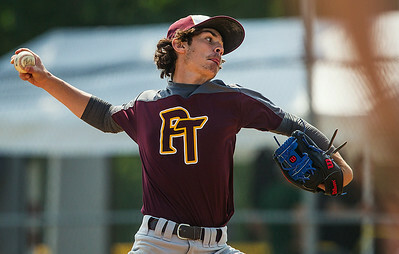 Kyle Grillot- kgrillot@shawmedia.com Japan's Shigehiro Suzuki pitches against Waukesha during the fourth inning of the McHenry County Youth Sports Association 15-U division baseball tournament final at Lippold Park Sunday in Crystal Lake. 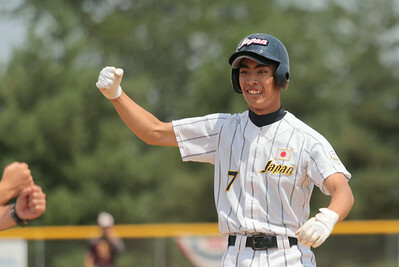 Kyle Grillot- kgrillot@shawmedia.com Japan's vcelebrates after hitting a triple during the seventh inning of the McHenry County Youth Sports Association 15-U division baseball tournament final at Lippold Park Sunday in Crystal Lake. Kyle Grillot- kgrillot@shawmedia.com Japan's Ryo Sekiguchi, (2), and Yuki Inoue (7) celebrate with their team after hitting a triple during the seventh inning of the McHenry County Youth Sports Association 15-U division baseball tournament final at Lippold Park Sunday in Crystal Lake. 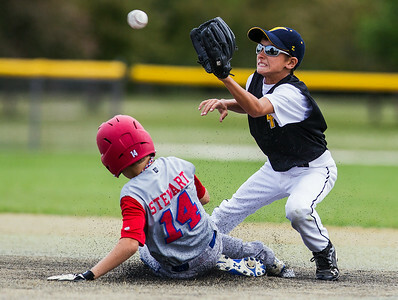 Crystal Lake Bulldogs' Ethan Stewart slides safely to second base as Lake in the Hills Thunder's Jake Lyon attempts to tag him out during the fifth inning of the McHenry County Youth Sports Association 11-U division baseball tournament game at Lippold Park Monday in Crystal Lake.